MozFest sessions were organized by different themes on each floor. “It’s all about making at MozFest,” a fellow session facilitator told me as we waited for his session to begin. MozFest, an annual conference hosted by the Mozilla Foundation, took place in London October 28–29. I had been telling him about my decision to forgo the first block of sessions in order to paint a robot on a tote bag. 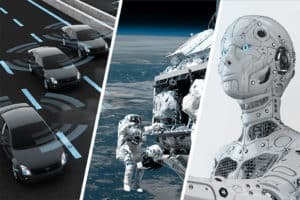 At the time, this felt like a renegade choice—most conferences focus on sharing information from experts to participants. Stopping to make something that seemed frivolous was a departure from my usual approach to conference participation. 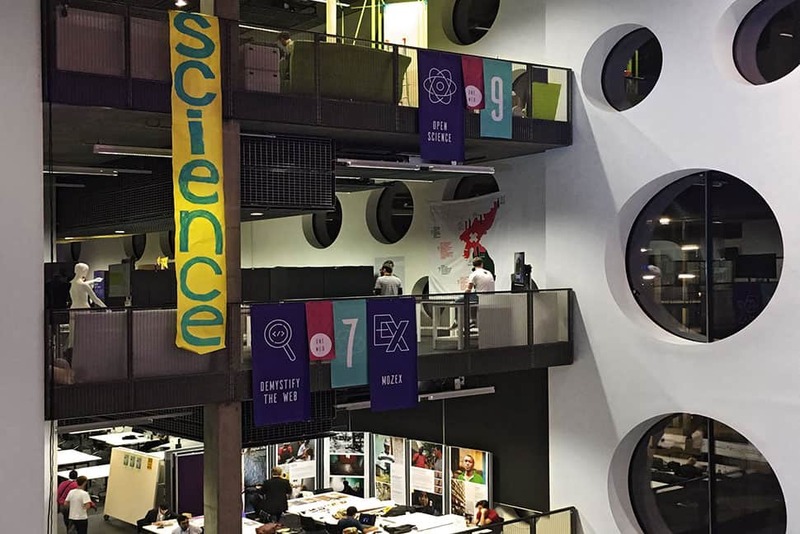 The nine separate spaces comprising MozFest were each curated by teams of “wranglers” who played host to each floor. Themed spaces featured handcrafted posters and signs, large-scale installations, and technology-focused exhibits. The pop-up nature of each floor made the experience of wandering through MozFest feel much like clicking through links on the early days of the web, before indexers like Google and walled garden like Facebook began to shape our collective experience of the web. 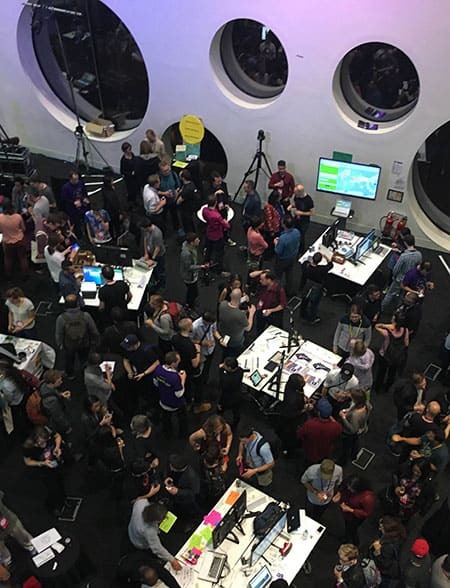 MozFest boasted more than 460 sessions ranging from the offline to the technically complex. The prevailing format for facilitated sessions focused on decentralized activities where participation from all voices was welcome. Some sessions, like small-scale Wikipedia edit-a-thons and creating networks using Raspberry Pis, required devices and connectivity, while others were purposely lo-fi. My favorite sessions involved teaching web literacy using offline techniques, such as creating board games, crafting, and face-to-face activities. 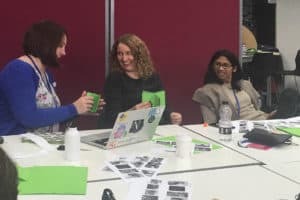 MozFest has a lot in common with the library world: As librarians, we care about sharing information, ensuring that the preferences of others (like copyright holders) are protected, and the well-being of others on the web. These themes were in abundance at MozFest, and the welcoming spirit attracted participants at all levels of experience with the web. DAVIS ERIN ANDERSON is community engagement manager at Metropolitan New York Library Council. She leads workshops on web literacy, digital fluency, and building community as an individual or as an organization. Along with Raymond Pun, she is an editor of and author featured in Career Transitions for Librarians: Proven Strategies for Finding Work in Another Type of Library (Rowman and Littlefield, 2016).